Love peppers but looking for something a little different? Well, if you love stuffed green bell peppers I think you will love this recipe! If you like your food really hot & spicy...increase the hot sauce to 4 to 6 drops or according to your own spicy taste buds. 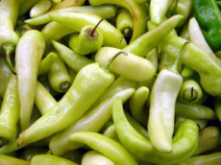 Wash and dry the banana peppers. Cut a "T Shape" in one long side of each pepper and remove the seeds and membranes. Spray a baking dish with nonstick cooking spray. In a large skillet, brown the lean ground beef with the onions and minced garlic. Once done remove from heat and set aside. Cook rice, drain away water. In a large mixing bowl combine together the lean ground beef mixture with the rice. Stir in the chopped salt, ground black pepper, basil, tomato sauce and hot sauce. (add as much hot sauce as your taste buds allow). Use a tablespoon to stuff the ground beef mixture inside of each banana pepper. Lay each pepper in the bottom of the baking dish. Sprinkle cheese on top. Preheat oven to 350 degrees F. Bake stuffed banana peppers for 15 to 20 minutes or until done. Remove and let stand at room temperature for 3 to 5 minutes before serving.